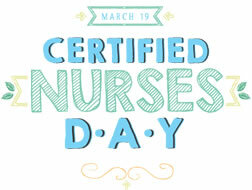 Today is a day to recognize board certified nurses in many nursing specialties. In infusion nursing, the certification is CRNI (Certified Registered Nurse in Infusion) awarded by the Infusion Nurses Certification Corporation (INCC). In vascular access, the certification is VA-BC (Vascular Access Board Certified) awarded by the Vascular Access Certification Corporation (VACC). Congratulations to all my certified nurse colleagues! !